Elegant and flavorful confection that pairs perfectly with an Easter lunch, baby shower, wedding shower, and other special occasions. A very unique and stunning dessert. Crack whole egg and yolks into a medium-small size mixing bowl. Set aside. In a saucepan, combine sugar, flour, cornstarch, and salt. Add water, lemon extract, and lemon zest. Mix. Cook over medium-low heat, stirring constantly, until mixture boils. Beat 1/2 cup of the mixture into the bowl with the whole egg and yolks; return to saucepan. Simmer 3 minutes, then stir in butter until melted. Pour or spoon into tart let shells; cool one hour. Add scraped Rodelle Vanilla Bean seeds into the sugar. Whip egg whites to soft peaks, then add sugar a little at a time, until stiff peaks form (takes 15 or more minutes to develop really stiff peaks). Fold in corn starch and vinegar until well blended. Whip for 5 more minutes. Use a cake pan to trace an 8” circle on parchment paper. Fill the circle with meringue. After meringue is placed on paper, you will form a well in the middle, while building up the sides to create a bowl-like shape out of the meringue. The well is created to hold the filling. Put parchment paper with “meringue bowl” onto a cookie sheet. Bake for about 1 hour and 15 minutes. Turn off oven, and let meringue cool inside. Combine halved strawberries in a small bowl with lemon, sugar and water – stir and let rest while making the rest of the dessert. Place mixing bowl and wire whisk attachment in the freezer to chill for 30 minutes (this is KEY). Pour in heavy whipping cream, vanilla bean seeds, and powdered sugar. Whip on low for 1 minute, and then turn mixer speed up to high. Mix until whip cream is stiff about 2 minutes. Remove cooked pavlova to a serving plate. Scoop lemon curd filling into the pavlova bowl and top with whipped cream in a mound – retain any leftovers for another purpose. Strain strawberries of excess liquid. 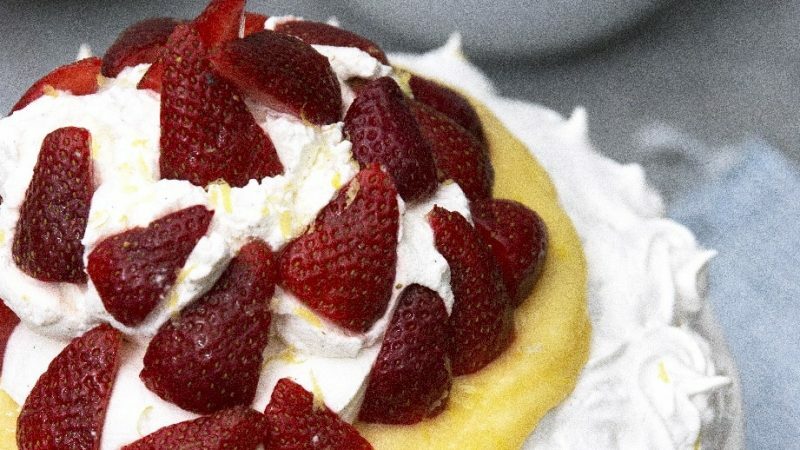 Arrange strawberry halves on the whipped cream and accent with the whole, fresh strawberries. Garnish with optional lemon zest.